In recent times, the talk of sustainability and ethical fashion has garnered a lot of media and consumer interest around the world. Numerous fast fashion labels whose fundamental business model goes against the idea of sustainable production, are now making “green” claims to lure responsible consumers, thereby giving impetus to a trend called greenwashing. “100% organic cotton. Manufactured solely using renewable energy generated from wind and solar power.” — so reads the tag on a T-shirt from the multinational Swedish clothing retailer, H&M’s ‘Conscious Collection’. Launched in the year 2010, H&M Conscious claims to be an initiative to offer “fashion choices that are good for people, the planet and your wallet”. H&M also aims to promote sustainable consumption among its buyers by offering them a discount of 15% for handing in their old clothes that it would later use to recycle. In theory, these measures seem highly noble, but in reality, they are possible greenwashing tactics — making customers believe that the brand is a lot more eco-friendly and socially-responsible than it actually is. H&M’s sustainability initiatives came increasingly under fire in the year 2016 when the brand initiated the World Recycle Week. An article published in the Guardian criticised H&M for its plans to collect and recycle 1,000 tonnes of unwanted garments – about the same amount of clothes it produces in 48 hours. The piece also noted that the brand would take close to 12 years to utilise the said amount of fashion waste. Further, the fact that H&M offers discounts to its customers for bringing in their old clothing was called out to be a strategy by the brand to drive more purchases. In September this year, the Clean Clothes Campaign published an upsetting report titled, ‘H&M: fair living wages were promised, poverty wages are the reality’. Back in the year 2013, H&M had published a ‘Roadmap towards a fair living wage in the textile industry’ that aimed to pay 850,000 textile workers a fair living wage by 2018. According to the CCC report, not only is H&M nowhere close to its previously-stated goal, but the brand has also removed the original fair living wages promise from its corporate communication material. H&M is among the top league of the world biggest fast fashion brands, pitted against the likes of Zara and Forever 21. According to its 2017 annual report, the brand generated upwards of 25 billion USD in global sales. Large-scale production volumes of low-cost clothing consume monstrous amounts of resources and contribute to the environmental footprint considerably. H&M’s efforts in the sustainability direction, therefore, seem highly contradictory to its very being. While such is the case with H&M: the fast-fashion brand that proudly carries the baton of sustainable and ethical fashion, its other fast fashion brethren are also attempting to tread the green route. In 2016, Zara launched its so-called sustainability line named ‘Join Life Label’. Last year, Mango also climbed on the bandwagon by launching its ‘Committed Collection’. The collection, comprising of 45 pieces (25 for women and 20 for men) claims to be 100% sustainable. It is important to note that Mango, a brand whose DNA is similar to the Zaras and the H&Ms of the world, impacts more than just the environment. The production for these brands, more often than not, happens in countries where the labour is cheap and working conditions highly poor. In 2013, 1134 garment workers died in the collapse of a factory building, Rana Plaza, situated in a suburb outside Dhaka, Bangladesh. Clothes of Mango, along with many other popular fast fashion brands like United Colors of Benetton, Zara, Walmart, C&A, Carrefor, Joe Fresh, etc. were being produced in the sweatshop, but Mango, was amongst the first brands to deny that it had any association with the factory. This is probably because Mango did not place a direct order with the factory but subcontracted it to a supplier. Basically, Mango had no idea where its clothes were being made, let alone being aware of the awful conditions in which the workers were making them. In 2016, BBC Panorama released a documentary titled Undercover: The Refugees Who Make Our Clothes. The investigation found Syrian refugee children and adults making clothes for popular high street labels like Marks and Spencer, ASOS and Next in Turkish sweatshops. It also reported that in a factory, Syrian refugees were working 12-hour shifts, distressing jeans for Mango and Zara under hazardous working conditions. According to the documentary, the refugees were paid close to a pound an hour — a remuneration well below the Turkish minimum wage standard. Last year, workers from an outsourced manufacturer for Zara were going into Zara stores in Istanbul and leaving tags reading, “I made this item you are going to buy, but I didn’t get paid for it” inside clothes. The workers were employed at the Bravo Tekstil factory in Istanbul that used to manufacture clothes for Zara, Mango and Next. In 2016, the factory shut overnight and its workers were left without three months of pay as well as severance allowance. So, when Inditex (Zara’s parent company), mouths powerful sounding statements like, “Inditex has always been fully committed to sustainability and the protection of human rights throughout its value chain”, it’s a little hard to digest. 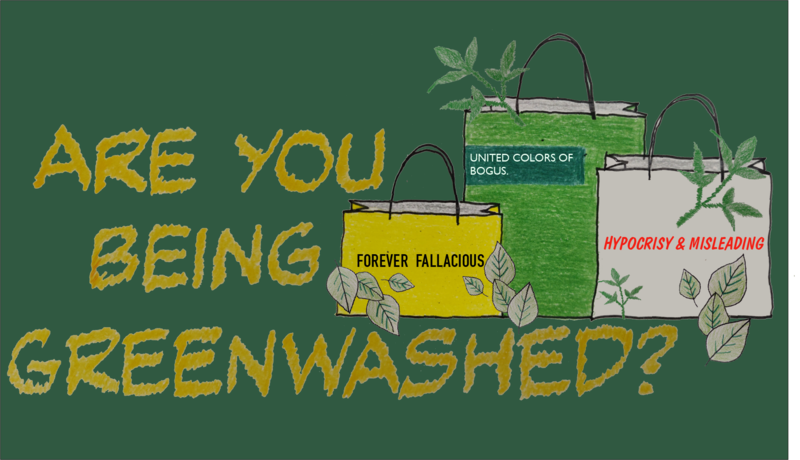 Forever 21, a favourite amongst fashionable shoppers on a budget, has also been guilty of greenwashing. In 2015, the fast-fashion giant, through a press release, proudly announced that its headquarters in the Lincoln Heights neighbourhood of Los Angeles had the largest single-rooftop solar-power system in Los Angeles County. Mind you, this is the same brand that mass-produces clothing majorly using polyester, in overseas factories that aren’t solar powered. These activities contribute to the carbon footprint to such a large extent, that the brand boasting about its solar-powered center seems no more than a gimmick to make headlines and appear environmentally responsible. Above are just a few among the many examples of how the fast fashion labels overplay their green endeavours in the hope of assuaging their irresponsible practices. It would be unfair not to acknowledge some of the genuinely good work that some of these brands are aiming to do in this direction, even though their efforts may be an afterthought. But, given the way their business model is built, even the best of their pursuits can create only a mere ripple in the ocean of mess that they have already created. Today, with our pockets becoming deeper, and clothing, cheaper, mindless purchasing has become a habit for many. Given the rate at which fashion cycles are moving and new styles are making their way into stores, the practice of buying and tossing clothes has become normalised. Remember, the true cost of that Zara dress is far more than what’s mentioned on its label. 1. Shop Mindfully – Remember, quality > quantity. Invest in organic fabrics, statement pieces, and stick to a capsule wardrobe. If like me, you are also a lover of variety, shop from vintage or thrift stores. 2. Upcycle and Donate – Instead of trashing garments you’re bored of, upcycle them to create something new. Even better, donate them. 3. Opt for Brands That Maintain Transparency – Brands that are open about the origin of their garments, their production practices, the labour they employ and their wage practices are the ones you should consider shopping from. A good way to gauge the sustainability commitment of a label is to check its rankings on platforms like the Good On You app and Rank a brand. These platforms provide fairly accurate performance measures for brands based on a wide range of sustainability factors.